Following on from the previously posted collection of these items (click here for that collection), and in honour of our recently departed friends Tiger and Lucy, who provided as much as half the inspiration for these quips, here once again, as Triumph the Insult-Comic Dog would say, "for you to poop on", my collection of this year’s "Signed, the Dog" status updates. This may be it for these, so enjoy. I’m not over-excited, you’re UNDER-excited, so ramp it up, two-legs! –signed, the dog. "And you will know me by the trail of poop". –signed, the dog. Of COURSE I’m not a-scared of no thunderstorm… I’m just sitting on your foot in case YOU’RE a-scared. –signed, the dog. You’re up because I’m up, that’s why you’re up. Any more questions, morning-breath? –signed, the dog. I chew, therefore I am… If it falls to the floor, it’s MINE! –signed, the dog. I just went 0-for-4 in the Table Scrap Toss event. I’m a disgrace to my race. –signed, the dog. Actually, I’m dribbling. Not drooling. There IS a difference you know. Dribbling has a much lower saliva content. –signed, the dog. You can call me an ungrateful cur all you like, I’m not going to love you any less. Lick, lick. –signed, the dog. I’ll pee when I’m ready to pee, and when I find the perfect spot. Telling me "hurry up" is not going help either of us. –signed, the dog. Dude, it was a CAT, I had to try. It’s what I do. That arm should pop right back in the socket. –signed, the dog. Dude, thanks for picking up my poop. I’d do it myself but, you know, no thumbs… –signed, the dog. Never mind what that used to be… it’s gone now, that’s all you need to know. –signed, the dog. If I test positive for curry, you’ll know you didn’t sterilize the container for long enough. –signed, the dog. Then don’t think of it as kissing, think of it as me tasting your face. Still no, huh? Fine. –signed, the dog. Are we really going for a walk, or are you just yanking my chain? –signed, the dog. Why yes, I AM ignoring you. I just didn’t think "Farty McPiss-Bag" was a name I should respond to. –signed, the dog. Thanks, but I don’t need the whole bed, just the part where your legs are… –signed, the dog. This entry was posted in Humour and tagged doggies on July 25, 2010 by admin. 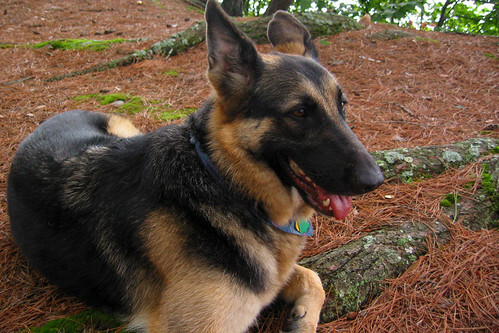 Incredibly, there is more sad news today… After having lost our bulldog, presumably to old age, just this morning (see previous post) word comes that our German Shepherd Lucy had to be put down. Lynda, who is in the city for a few days, had tried to see Lucy earlier in the week, but was told she had a sore leg and they wanted to keep her off it. So she thought she’d try later in the week. Well today, they had Lucy in to the vet, and it turned out she had cancer, and it had spread into her bones. There was no choice. Lucy was my first dog. I’d been around them, Lynda had dogs, but never had my own dog. Lucy was intended to be a companion for my mother-in-law, but proved to be more than Doreen could safely manage. Having been abused as a puppy and reclaimed by the breeder, Lucy was quite skittish and difficult. But I won her over with cheese, and she was my best friend for ever after. She pretty much adopted ME at that point. She was always so gentle and timid with us, that it was surprising that she became as aggressive as she did towards other people. Fiercely protective, I guess, of her hard-won family stability. Which made it that much more painful to have to send her away. This entry was posted in RIP and tagged doggies, Lucy on July 22, 2010 by admin. A couple of months ago we lost Lucy, our German Shepherd. See Goodbye Lucy (May 14, 2010). But she’s still living on the farm and we can visit her from time to time. 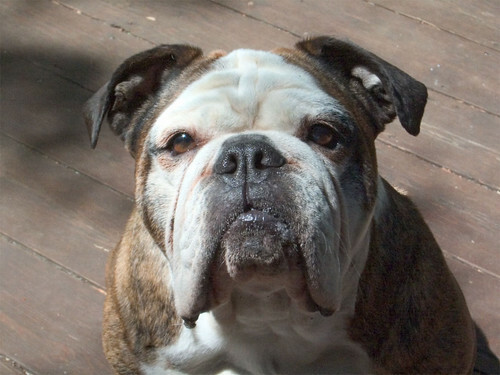 But this morning we lost our dear sweet bulldog, Tiger. For real. She’d not been well the last couple of days, but gamely rallied for pee breaks, tackling the stairs (slowly) to join the other dogs for a trip out back. Last night, with some encouragement, she managed to hop up into her favourite chair to go to sleep. This morning I found her under the bed. She was gone. There is a limit of three dogs per household in our municipality, so we had to license Tiger under Doreen’s name, since she lives in a different municipality (albeit just down the road). So I’m glad she got to see her off. They were the best of friends. So very sad. Going to miss her so much…. This entry was posted in RIP and tagged doggies, Tiger on July 22, 2010 by admin.